Collecting Doulton flambé with silver overlay. Collectors often have to do a double take when they eventually do come across early Doulton flambé vases and other small objects that have been given a silver overlay, for so little is known of these pieces. 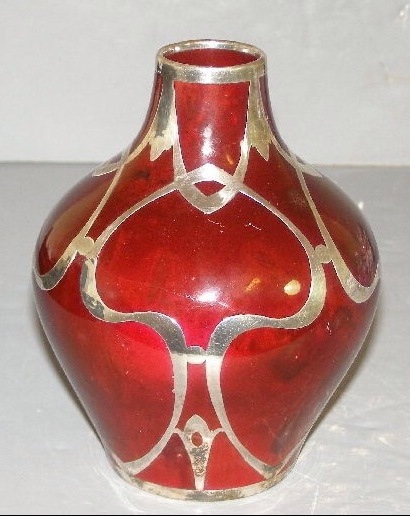 A typical early flambé shaped vase with silver overlay. From what I have been able to discover, Doulton supplied the American firm Gorham with the ‘bare’ flambé pieces, for their in-house artists to apply a silver overlay to; typically of art nouveau design. The US firm Gorham, founded in 1831, had strong links with Doulton until 1963 via employees, although the use of silver overlay seems to have been limited to the early 20th Century. These extravagant art nouveau designs were originally available in the US market alone so rarely turn up here in the UK. However, it is possible to find flambé finished with silver tops and rims, usually tea wares and vases, here in the UK and typically by the prestigious firm George Betjemann. Perhaps you own examples of this type of flambé? If so why not share a picture on our Facebook page ‘Doulton Collectors Club’?